On Saturday, November 25th, Brazilian UFO Magazine’s editor A. J. Gevaerd received a call from Bahia with an intriguing story. 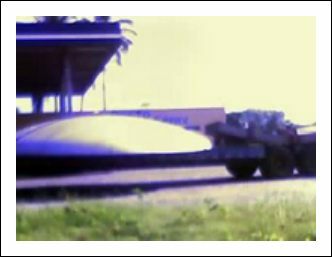 The caller was Francisco Baqueiro, a psychologist and therapist, magazine’s consultant in abductions, who said to have photographed with his cell phone a strange and perfectly disk-shaped flying object being carried by a non-identified truck in a road in the Brazilian state of Bahia. The picture was taken on Tuesday, November 21st, at 07:16 AM. Baqueiro said he heard of the transportation one day before when an informer from an intelligence service called him telling an unknown artifact crashed and was recovered in an area in Bahia known as Recôncavo Baiano, south of the capital Salvador. So what is this thing anyway? Looks like it is laying flat on the truck bed. The curvature doesn’t look right for a parabolic antenna and somehow it doesn’t look right for a tank cap. Too bad the image was taken with a cell phone. A toke a day keeps the embalmer away?? Not likely. A 120-year-old woman claims that smoking cannabis every day is her secret to long life. Fulla Nayak, from India, says she reached the age of 120 by smoking pot and drinking strong palm wine in her hut everyday. She is living with her 92-year-old daughter and 72-year-old grandson. December 5, 2006 Posted by oldstersview | Uncategorized	| Comments Off on A toke a day keeps the embalmer away?? Not likely. An angler has broken his own record for landing the world’s heaviest carp – with the same fish he caught last time. Gary Hagues, 34, hooked the 87lb 2oz fish while on a holiday he won for catching it last time, reports the Sun….Gary battled for 30 minutes to land the carp at Rainbow Lakes in Bordeaux, France. The fish had grown – it weighed 83lb 8oz the first time he caught it. Experts said setting a new record twice with the same fish was a million-to-one chance. “Experts”?? How do you get to be an expert on “catching the same fish twice”? Is there a college degree or something? 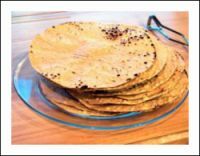 Man holds on to poppadom eating title—poppadom?? A Dundee man has held onto his world record poppadom eating title. Tim Stobbs beat 15 competitors to eat 15 poppadoms in five minutes at St Andrews. It is the third successive year he has won the title, in aid of Cancer Research. December 5, 2006 Posted by oldstersview | Uncategorized	| Comments Off on Man holds on to poppadom eating title—poppadom? ?